Lightning McQueen and his crew pit are excited to join you at your Cars Party. All of your little friends will be so excited to see the new race in the new film that will take place throughout the world (destinations in Japan, Germany, Italy, France and the United Kingdom). To make homemade Cars Party Invitations, on cardstock paper cut out the shape of a car. Outline the card with a black marker (to keep it simple). 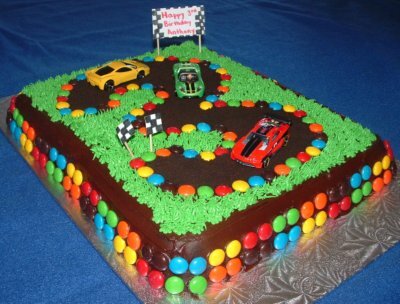 Write something cute like, “Rev up your engines and race on over for ____’s # Cars Birthday Party”. And add some shiny Car stickers. On your driveway, use sidewalk chalk and draw a road way leading to the front door. Write welcome to Radiator Spring and if you wish draw the buildings (Cozy Cone Motel, Sarge's Surplus and Flo's V-8 Café). Red Light - Green Light Have one guest yell "Red Light and Green Light! (stop and go) while the other party goers try to get to a certain destination without getting caught moving during a Red Light. Tire Racing Get small hula hoops and spin them on their side to get through a race. World Grand Prix Obstacle Course Have each guest having a car to push through the obstacle course. Go over and under bridges (use a cardboard box), go off roading (through the sand), around curves in the road (cones), and fly to other countries (tip toe through tires holding onto the car). Tire Art Use either marbles or cars with different tire tracks. Put a piece of white art paper in a photocopy box lid. Put different colored paint on paper plates. Get paint on the marbles or car tired (drive them through the paint). Then drive the car across the paper, or roll marbles over the paper. Share Your Cars Party Ideas Here!